This species is accepted, and its native range is N. & Central America to N. Argentina. Perennial; caespitose. Rhizomes short; scaly. Culms 50-80 cm long. Ligule a fringe of hairs; 0.5 mm long. Leaf-blades 10-30 cm long; 2-7 mm wide. Leaf-blade margins tuberculate-ciliate; hairy at base. Inflorescence composed of racemes. Racemes numerous; 35-80; borne along a central axis; deflexed; cuneate; unilateral; 1-3(-4) cm long; bearing few fertile spikelets; bearing 1-12 fertile spikelets on each. Central inflorescence axis 15-25 cm long; flattened. Rhachis deciduous from axis; angular; terminating in a barren extension; extension bristle-like. Spikelet packing broadside to rhachis. Spikelets appressed; solitary. Fertile spikelets sessile. Spikelets comprising 1 fertile florets; with diminished florets at the apex. 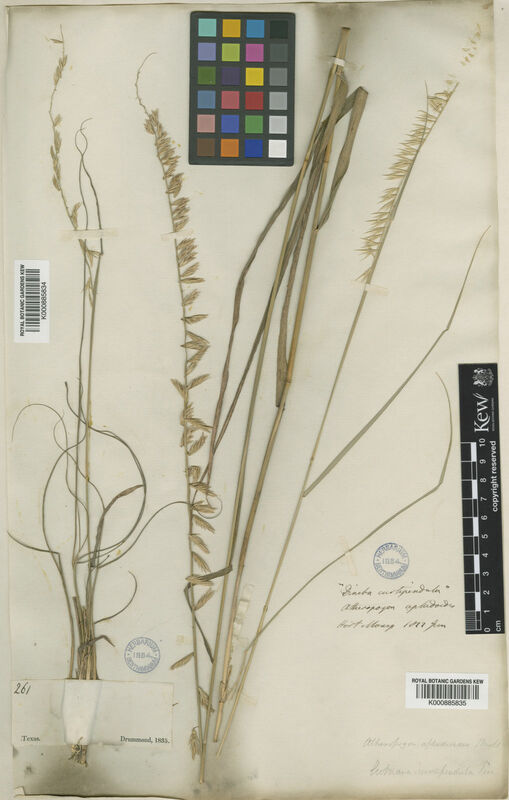 Spikelets cuneate; laterally compressed; 5.5-8 mm long; falling entire; deciduous with accessory branch structures. Glumes similar; exceeding apex of florets, or reaching apex of florets; thinner than fertile lemma; gaping. Lower glume lanceolate; 4-5 mm long; 0.66-0.75 length of upper glume; membranous; 1-keeled; 1 -veined. Lower glume primary vein scabrous. Lower glume lateral veins absent. Lower glume apex acuminate. Upper glume lanceolate; 5.5-8 mm long; 1.1 length of adjacent fertile lemma; membranous; 1-keeled; 1 -veined. Upper glume primary vein scabrous. Upper glume lateral veins absent. Upper glume apex acuminate. Fertile lemma ovate; 5-7 mm long; coriaceous; keeled; 3 -veined. Lemma surface smooth, or asperulous; rough on veins. Lemma apex dentate; 3 -fid; mucronate; 3 -awned (mucros). Rhachilla extension glabrous. Apical sterile florets 1 in number; barren; oblong; 0.5-0.75 mm long. Apical sterile lemmas lobed; 2 -fid; acute; awned; 3 -awned. Apical sterile lemma awns 3-7 mm long. Caryopsis with adherent pericarp; ellipsoid. Embryo 0.66 length of caryopsis. North America: western Canada, eastern Canada, northwest USA, north-central USA, northeast USA, southwest USA, south-central USA, southeast USA, and Mexico. South America: Mesoamericana, western South America, and southern South America. Alt. 500 - 2500 m.
Nativa en Colombia; Alt. 500 - 2500 m.; Andes. Heterostega curtipendula Schwein. ex Hook.f. Campbell, D. (2012). Noteworthy collections. North Carolina Castanea 77: 80-81.